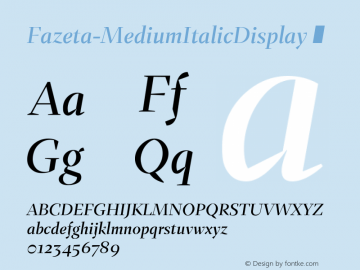 Fazeta-MediumItalicDisplay font family series mainly provide ☞ and other font styles. 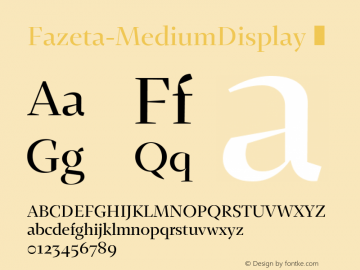 Fazeta-MediumDisplay font family series mainly provide ☞ and other font styles. Fazeta-BlackItalicDisplay font family series mainly provide ☞ and other font styles. Fazeta-BoldItalicDisplay font family series mainly provide ☞ and other font styles. 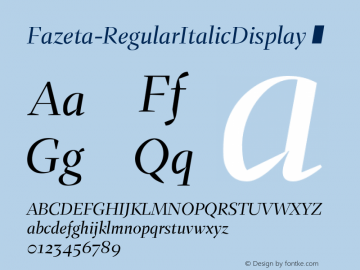 Fazeta-RegularItalicDisplay font family series mainly provide ☞ and other font styles. Fazeta-LightItalicDisplay font family series mainly provide ☞ and other font styles. Fazeta-Display 2 font family series mainly provide Regular and other font styles. Fazeta-Display 4 font family series mainly provide Regular and other font styles. Fazeta-Display 3 font family series mainly provide Regular and other font styles. Fazeta-Display 6 font family series mainly provide Regular and other font styles.